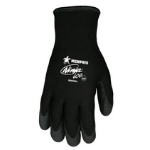 Our Ninja® Glove Line offers the greatest assortment of dexterity, sense of touch, and protection. The Ninja® Ice features a 15 gauge black nylon shell with a 7 gauge acrylic terry interior liner. Black HPT coated palm and fingertips.